The Chinese believe that there is a divine unfolding for everything that happens in our life. Spiritually tied to the mystic world, many believe that we are helped along by God and angels that assist us on our path. Things that may seem serendipitous to the normal everyday person are divine interventions at play. If this is so, how many clues have we missed over our lifetime because our lack of awareness of the good that flows in our life? Several years ago, my spouse and I hit a plateau in our consulting business. We had a wonderful stream of customers, and it was steady, but our growth was at a standstill. We were doing business the traditional way: sales calls, referrals, and advertisements with no automation. We found it frustrating as entrepreneurs to manage all aspects of the business, from products to production, to sales and marketing. We prayed for a different way of being. Having seen ads online, coupled with social media marketing, landing pages, and funnels, I asked for a path to deepen my understanding of how all this works. It all looks great, but I had no clue as to where to get started. At the time, I was still in ministerial school, with a new baby on the way and I had my hands, heart and time full and joyfully brimming. Our traditional consulting business went on as usual as I finished graduate school, and beyond. I was unsure of what my professional future would hold, but this I knew: I did not want to miss a moment of my kids' childhood. It was really important to me that they know their Mom is there - present and available for them, anytime. I wanted them to have easy access to me. At the same time, my determined ambition to explore and deepen my professional endeavors continued to call on my heart. I wanted to continue holding space for others to find their path using my skills, talents, education, and experience to support them. Serendipitously, I stumbled onto an online course a couple years ago about how to build an online course. Having a peek of how it all works, I was hooked. The lightbulb came on!! I could easily see that teaching online would allow me the lifestyle business I was searching for: I can build community online, around the subject matter that I am passionate about, attract those with whom the subject resonates, and still be around for my family. I had the vision of possibility in my minds-eye. Execution, however, was another thing entirely! I put myself on a learning curve. Usually a quick learner, I thought I would excel quickly and have thing sup and running within 6 months. Surely, by 3 months, I would have a course down pat! There was much to learn, and I thoroughly soaked it up like a sponge. Along the way, however, I experienced my own resistance to the process. The best way to describe the journey is to say that it is very much like the weight-loss journey. Knowing what to eat, and the actual practice of following a regimen of nutrition and exercise are very different things. There is a goal that I wanted to achieve and you would think I would simply go from point A to point B very easily. However, my experience of this was very different. I had many things to accomplish and overcome, both in my learning process and within my own consciousness. I needed to learn the technical "how-tos." If I equate this to losing weight, it would mean that I needed to learn what is healthy and what my body needs to sustain itself. And then, there is the inner stuff. In the journey of building an online business, the inner stuff is the processing of what I am learning, balancing my life with kids, running another company and managing my energy with productivity. If I equate the inner journey to losing weight, it would mean a whole different attitude, relationship and behavior with food. The outer journey is directly related to the inner journey. That is, the technical and practical sides of learning how to build a business online is directly related to my attitudes, behaviors and everyday practice of how I see myself. I have learned that building a business online is a viable path to practice presence, spiritually, emotionally and technically speaking! There is a snowball effect with wanting to put a course online that no one told me about. I had no idea that the excitement for the possibility of an online business could result in so many million little steps that I did not anticipate. In order to have a course online, other factors are directly related to the process. Here are some of them: The subject matter, curriculum, the process of putting videos and audio on mine, the best platform to host the course, creating a website for credibility, creating marketing channels to tell people about the course. Other critical components of running an online business include building an engaged email list, networking, growing your social media following, leads nurturing and development, product development, blogging ... and the list goes on. I've noticed how loud my inner voice is when I am working on a project on my own. Like fellow entrepreneurs, I start out with a vision and zeal. Creativity brims and flows over the top and I find myself vigorously writing my ideas down on a journal as it arrives in consciousness. I would pick a topic to work on, write out a project plan, and when it comes down to following it step by step, day to day, I am wanting to find someone to hand it off to. Knowing what I want to say in a 6 video course is very different than actually producing the videos. Knowing the steps to take, and actually taking them with the small amount of time allotted are two very different things. My time constraints are justified by the need to take care of my family. As the mom, I also have a responsibility to drop off and pick up my children at specified designated times. I'm also responsible for packing school lunches and contributing to our existing consulting business. Even with a detailed schedule and the best time management skills and resources, I find my energetic body is forever chasing after my emotional body or vice versa. As I witness millennials zip through social media, I feel quite like Wiley-E-Coyote - spinning in a circle as the roadrunner gives him a run for his money. No longer a 20 something, or even a 30 something, this older momma of 2 amazing brilliant breastfed children no longer runs at the same pace she used to. Different things matter now, and I find myself looking deeply at what really is important and continuing to drink in every moment of life. Every breath with a deep abiding appreciation for all the blessings I have in my life: my beautiful family, my loving husband, my health and my amazing support system. This is the gift I received - the awareness that I already have everything I need. Anything else that unfolds on top of that, is simply over-the-top and will happen when it does. Look deeply at what's really important to you. The desire to build a lifestyle business is a soul's call, but, in addition to making things work, presence to the inner journey is of great value. As a simple practice, write down three things that are important to you and place them on a sticky note. Read them aloud to yourself in the mirror immediately after you wake up and right before you sleep every evening. Allow your consciousness to grow and mindfully hold them in your awareness throughout the day. 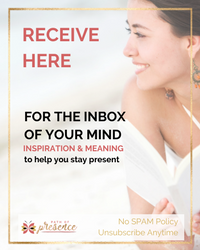 See what unfolds, and email Evelyn to share!